We have had the windows open all weekend and I love it! I have heard the birds singing, wind-chimes ringing, and felt the breeze coming in the windows. I love everything about fall--weather, decorations, food, trees changing (although they are not changing here in AL yet). The one thing I don't like about fall is that winter is on the way. Although I am hoping being in the South that means it wont be as cold as a KS winter! 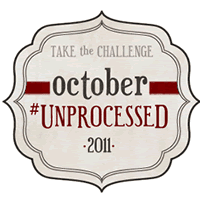 On another topic I am participating in October Unprocessed Challenge with eating Rules. The challenge is to avoid processed foods for the month of October. For the most part we already eat real/whole food and not processed foods. Although some evenings we cave and order pizza or go out to eat. So for this challenge this month we will try not to eat out at all. I am also going to avoid sugar (except for the honey I put in my morning coffee). This means no Starbucks, no baked goods, and no candy corn! This will be the toughest part for me, as I love Starbucks and candy corn! This is a great challenge for this month because I am also starting a month long boot camp tomorrow. It is 5 days a week for the month of October. I'm excited for the physical challenge and having a jump start to getting in shape. I have a feeling I will have a hard time walking and sitting this week! Hope you all had a great fall weekend. What is your favorite part about fall? Oh! I love the candy corn too! Lol but I really like the crisp smell on fall days...that wreath is super cute! I have a few projects going at the moment but would love to try it out. Deffinitly like the October challenge...all except for no candy corn! I will have to read up on it...we could always start late! Lovely fall wreath! Thanks for visiting. I'm your newest follower too now!